Sailing from Greece up to the East coast of the Black Sea with the promise of delivering the Golden Fleece to an ancient king, Asterion and the other Argonauts embarked on an adventure where they encountered a giant, clashing rocks and an ever-wakeful dragon. 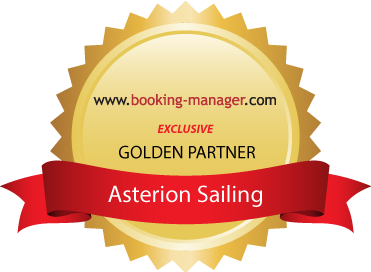 We at Asterion Sailing have made it our mission to offer our customers an unrivalled sailing experience. Asterion Sailing stands for unforgettable sailing holidays and Oceans of Comfort. Asterion Sailing comprises a group of companies which are fully owned and managed by Asterion Holding B.V.our Dutch holding and management company. We also operate an office in Athens, Greece. The yachts are owned by so-called Greek Maritime Companies of Pleasure Yachts (MCPY), which we set up for this very purpose. While Asterion Holding B.V. was only founded in 2016, some of our MCPYs exists since almost 10 years and the Asterion management team has extensive experience in the sailing industry. As a boutique yacht company we focus currently on the Ionian sea with our main base in picturesque Corfu and a satellite base in Preveza with a view to open new bases only if we can assure the quality our clients want to receive. We also offer selective yachts in Athens - perfect to explore the Saronic Gulf. We clearly differentiate ourselves by offering sailing yachts that set new quality and equipment standards that will make your stay a dream come true. As you can see in the Reserve Our Yachts section, our yachts feature extras such as USB hubs in every cabin to charge your mobile phone, sanitisers in all toilets for a scentless experience or upgraded dinghies for the larger yachts to just mention a few. Unlike many other companies, we actually own each and every of our yachts and take great care of them. We have our own people on the ground that make sure that our yachts are always in a perfect and clean condition. We own all our yachts and we also use them for our own holidays. Hence, we know them like the back of our hand and we can be confident about the condition they are in. We believe that we have probably the best equipped bareboat charter fleet in Greece. But make up your own mind and have a look at the detailed description of our Yachts. Our credo is: Oceans of Comfort! We only make promises we can also keep. Our staff is highly experienced and we know what it takes to deliver you the yacht you expect. Within our group of companies we also have a maintenance and spare part supply company which allows us to offer superior quality at every step of the value chain. We are a small boutique sailing charter company - and exactly because we are small we can take care of you, your holidays and our yachts. While we made every effort to describe us, our yachts and Greece as a fantastic saling area we would like you to reach out to us for a more personal discussion. We want to make sure that you get exactly the yacht you have been looking forward to sail.